I had the pleasure of a late spring voyage through the sagebrush sea. It was a wonderful break from the grueling tasks of mundane reality, and I found some interesting new developments to pass along to you. Tonopah had a lively Jim Butler Days, the hallowed event has been returned to Memorial Day Weekend where it has anchored the central Nevada calendar for generations. The State Mining Championships, traditionally a major attraction at Jim Butler Days, have been tentatively scheduled for Labor Day Weekend this year, to be held at the Tonopah Mining Park. 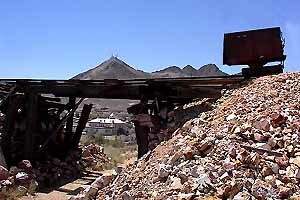 If you’re interested in Nevada mining and its history, this is the event for you. Details in a future Trip Report. The big news in Tonopah is the re-opening of the Station House Hotel and Casino under the ownership of Las Vegas auto dealer Jim Marsh. Now, where’s the hero who’ll bring the Mizpah back to life? Another candidate for “The Best Margarita in Nevada”: the Tularosa Cantina at the Ramada Express in Laughlin. From Tonopah I drove east on US 6, and turned right at Warm Springs on the Extraterrestrial Highway(Nevada 376). Rachel was crowded with earthlings as proprietors Joe and Pat Travis of the Little Ale’Inn were beaming up for a re-provisioning trip to Las Vegas. 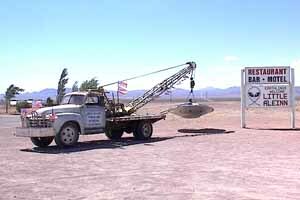 Pat tells me interest in Area 51 is as high as ever, with visitors arriving daily from all over the solar system. From Rachel it’s another 35 miles to US 93 at Crystal Springs, and then five miles south to Ash Springs. I am trying to learn how the city of Searchlight got its name. I have driven through Searchlight at night and noticed the strobes on radio antennas on a mountain. I do not know if this has any connection but I have been led to believe that it was due to having a radio station used by vessels in the Pacific for the purpose of navigation. I was in Searchlight recently myself, and stopped in at the little Museum just east of town on the Cottonwood Cove road. Check out the display the next time you drive through, it says the Mining District (and therefore the town that grew up there) was named for a brand of matches. The display includes a piece of the wooden box they came in. It’s big enough to serve as a small ‘writing-desk’ (the original laptop!) and I can picture a group of elated miners searching their excited minds for a name to give their discovery, and nobody accepting another’s favorite (“Let’s call it the Bonnie Sue!”) until finally an eye falls on the box. P.S. One more note of interest about the name: Scott Joplin wrote “The Searchlight Rag” for friends who’d invested in mines here. Despite obstacles, Ash Springs is once again a family destination. self.” The little resort that had welcomed travelers since pioneer times, with its warm water swimming hole was closed, fenced off and locked away. “The happy shouts of splashing children no longer ring out in the hot dry air,” I sniffled. So when I pulled into R-Place for gas I was startled to hear . . . the happy shouts of splashing children from across the highway. 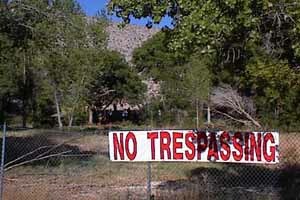 The chain link fence is still up, and even sports big new “No Trespassing” signs. But someone has chopped a hole through the fence, more than a dozen cars were parked beside this entrance, and all’s right with the world once again. Apart from gasoline, soda pop, sun glasses and fried chicken, R-Place offers an unusual attraction: the bird’s nest in the “O” on the Texaco sign. 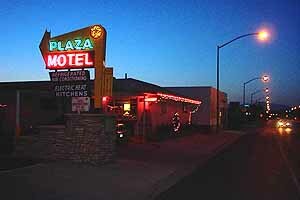 I stayed the night in Overton, at the Plaza Motel. The Plaza was new in 1955, and has just been restored to its full Elvis-era glory. But the pleasures of the Plaza aren’t merely architectural, it’s clean, quiet and friendly. Much of its trade comes from Lake Mead fishermen who bring home the catch to clean and grill on the Plaza’s barbecue. If the fishing is not good, you can get a nice steak at the grocery down the street, and impromptu barbecue parties are common. 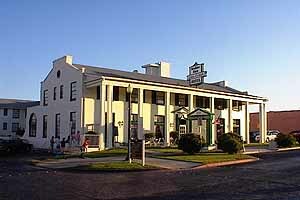 I find myself searching for reasons to come back to Overton so I can stay at the Plaza again. From 1955 Overton I went to 1933 Boulder City. That’s when The Boulder Dam Hotel opened to accommodate visiting government and business guests involved with the building of Hoover Dam. It is not fancy, but it is solid and very comfortable, everything original, immaculate, and freshly remodeled. My room, one of only 22, was decorated with the prints and paintings by the celebrated local artist Cliff Segerblom (there’s an Art Gallery on the first floor). I was able to get online and retrieve two days’ e-mails without a lick of trouble. A Chamber of Commerce Information Desk in the lobby is staffed by volunteers, and the Boulder Dam Cafe serves “three dam good meals, seven dam days a week,” including a full breakfast for hotel guests. 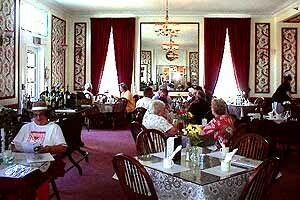 , and a 20-year labor of love by the entire community has restored its original luster. And lustrous it is, in the almost-art-deco fashion of the mid-1930s. My breakfast was served on the front veranda beneath the high pillared portico where I exchanged greetings of the day with local folks walking past. The sky was blue, the temperature in the low 70s, the eggs perfectly poached and the world a bright and cheerful place indeed. That’s Boulder City in a nutshell.